A stormy and rainy start to the week (dropping near one inch of rain in St. Peter) has given way to a midweek cool down, as today high temperatures are comfortably in the 70’s accompanied by relatively low humidity levels here in southern Minnesota. But all this is about to change as a warm front brings showers tomorrow, followed by sweltering 90-degree weather beginning on Friday and persisting through at least next Wednesday! Precipitation looks to be scarce next week, so hopefully humidity levels continue to stay low; with highs in the upper 90’s on some of the days, however, there is no denying that it is going to get HOT outside. 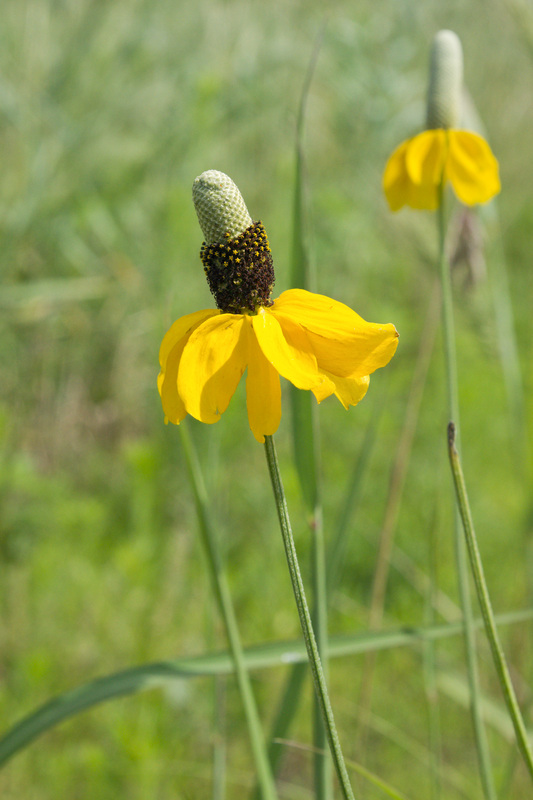 The 70-acre Coneflower Prairie, currently in its third year of growth, is bursting with life right now. Forays into the grasses both yesterday and today yielded a bounty of interesting sightings, from singing Dickcissels to mating Monarchs to blooming Black-eyed Susans. The most common wildflowers you’ll find in bloom right now are the vibrant yellow Long-headed Coneflowers, similar in appearance to the Prairie Coneflowers planted throughout the Uhler Prairie but with longer “cones.” You’re also likely to come across the blooms of Hoary Vervain, Canada Milk Vetch, Wild Bergamot, and Mullein (a non-native and invasive species). Long-headed Coneflower blooming in Coneflower Prairie, 7/12/11.